Laidre, K. L. NASA Biodiversity and Ecological Forecasting Team Hyperwall presentation. Laidre K. L. Spoken Presentation. Females roam while males patrol: Divergence in breeding season movements of pack ice polar bears (Ursus maritimus). Ecosystem Studies of Sub-Arctic Seas (ESSAS) Open Science Meeting, Seattle, WA May 22-26, 2011, Comparative Studies of Polar and Sub-Polar Ecosystems. Laidre, K. L. and M. P. Heide-Jørgensen. Spoken presentation. Title: Linking spring productivity to bowhead whales in a coastal Arctic ecosystem. Laidre, K. L. and M. P. Heide-Jørgensen. Invited Speaker. Title: Narwhals and the pack ice habitat. Awarded Best Spoken Presentation. Laidre, K. L., M. P. Heide-Jørgensen, R. Dietz and R. Hobbs. Spoken presentation. Title: Winter predation and resource selection by narwhals. Laidre, K. L. Spoken presentation at the conference workshop on ‘GIS and Spatial Modeling’. Title: Combining satellite telemetry and spatial models: Narwhals in the high Arctic. Heide-Jørgensen, M. P. and K. L. Laidre. Spoken presentation. Title: Tagging and tracking of bowhead whales in West Greenland. Laidre, K. L. Spoken presentation. Title: Deep ocean predation by narwhals revealed by satellite telemetry. Dietz, R., J. Teilmann, O.D. Henriksen and K. L. Laidre. 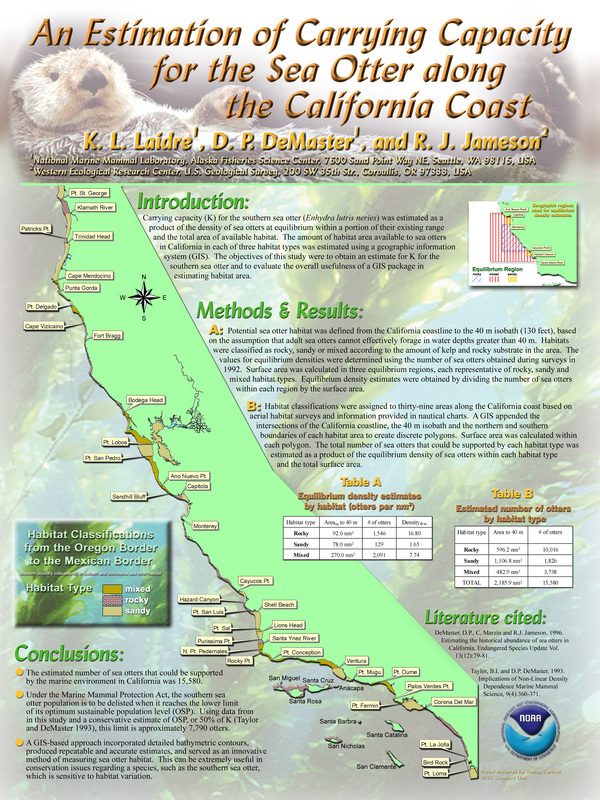 Poster presentation. Title: Satellite tracking as a tool to study potential effects of offshore wind farm on seals at Rødsand. Rugh D. J., K. L. Laidre, K. E. W. Shelden, and B. A. Mahoney. Poster presentation. Title: A shrinking distribution of a declining beluga population. Laidre, K. L., K. E. W. Shelden, D.J. Rugh, and B.A. Mahoney. Poster presentation. Title: Distribution of beluga whales and survey effort in the Gulf of Alaska.